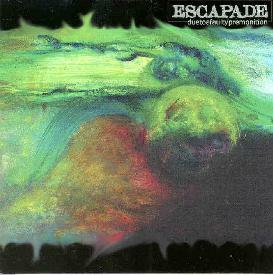 Escapade - "Due To A Faulty Premonition"
Standard procedure is to point out (as the CD liner notes do) that all Escapade music is "composed collectively and spontaneously" with no overdubs. That is, all improvised whether live or in the studio. Escapade's music is similar to early spacey improvisational Krautrock, but they also explore ambient music and a bit of jazz as well (see profile/interview last issue). The band is New York City based and includes Paul Hilzinger on various keyboards and synths, and percussion, John Ortega on various synths, sounds, and processed bass, Paul Casanova on electric and acoustic guitars, percussion, and electronics, Joey Murphy on electric guitar and percussion, Hadley Kahn on drums, percussion, and analog synth, and newcomer Russell Giffen on bass. The disc starts on an easy note with "Sound Trap", an acoustic ambient piece that holds the complexity until later. This is like an extended introductory tune, not so much developing as it does lay down a basic theme around which the musicians create sounds and atmosphere. Escapade straddles the fringes of exploratory Krautrock, ambient, and avant-experimentation, and with "When A Squall Line Beckons" we now start to get more intensely into this territory. Again we have a basic pattern that the band works around, but the pattern itself is a swirling glom of guitars and synths with some guitar notes that, though intermittent, have a great raw Krautrock tone and sounds like it's being played in a cavern. It's impossible to describe all the various sounds that crop up throughout the music. During the last couple minutes of the song the intensity level builds to a feverish pitch, only to ease into a smooth landing. "I See Things" starts off as a space jazzy piece with bubbling synths that sound a little like Sun Ra and includes rapid dancing guitar runs. But it soon develops into an avant space chamber music piece. Very atmospheric, yet at the same time busy. Spaced out Krautrock meets Sun Ra. On "Singe" the guitar again adds a jazz element to the music. But this is an electronic freakout tune as well with a pounding bass line, wildly whooshing synths, and, again, more varieties of pure sound in several minutes than you could ever keep track of. "Undoubtedly" is similar to "Singe" only the jazz guitar is accompanied by a totally acidic freakout guitar. The combination and contrast between the two guitars is gorgeous, making this my favorite track on the disc. The tune even gets down with funky wah-wah psych guitar joining the acid guitar and prominent tribal drumming. Finally, "Postscript: A Flickering" closes the disc with orchestral synth textures and ambient guitars. In summary, another fine set of Escapade's space explorations that fans should check out. This is the band's fifth release and I would say either this CD or their previous release "Citrus Cloud Cover" would be a good place for the uninititated to begin. You can visit Escapade at their web site.